Spinach helped launch my career as a garden writer, because my first published article was on growing winter spinach. Much has changed since then, especially the use of low tunnels for cold-hardy crops, which makes growing winter spinach easier than ever. With a few decades of spinach-growing behind me, in several different gardens, here are my top tips for getting great crops from spinach planted in the fall. In any season, spinach grows best when given rich, near-neutral soil that has been enriched with composted manure or other nitrogen source, and this is especially important when growing winter spinach, which will stay in the ground for up to seven months. Even when planting spinach after heavily-fertilized veggies like sweet corn, I have found that spinach benefits from having its soil amended with a thick blanket of garden compost and a balanced organic fertilizer. Spinach can have germination issues in any season, but in my experience germination is better in late summer than in spring, probably due to warmer soil temperatures. But very hot weather also can lead to spotty sprouting, so you may need to sow seeds more than once to get a good stand. Then there is the issue of when the spinach will mature. I make my first fall planting in August, but this sowing is intended for heavy harvesting in October. Spinach for growing through winter is best planted a little later, in September, so that the plants become established, bear one light harvest of baby greens in late fall, and then go into a state of semi-dormancy through the dark days of winter. Then, as soon as days become longer February and March, the plants will produce harvest after harvest of sweet, tender leaves until the plants bolt in late spring. Crowded spinach plants tend to stay wet for prolonged periods of time, which can lead to problems with a number of diseases that plague winter spinach. Most of the spinach varieties gardeners like to grow, including ‘Bloomsdale Long Standing’ and ‘Giant Winter’ (also called ‘Viroflay’) are susceptible to downy mildew, so it’s important to keep plants thinned and weeded to help fresh air circulate through the leaves. Several recent research projects in the US have found that winter spinach grown in a low tunnel covered with row cover grows just as well as spinach grown in greenhouses or high tunnels. In addition to moderating temperatures, low tunnels shelter winter spinach from ice and snow, and keep the leaves reasonably dry as well. I have experimented with many different setups, and have found that I prefer a glass-topped cold frame because it stays put in high winds, and never collapses due to heavy snow. Because winter spinach stays so close to the ground, it is never cramped by the top of the frame. Ventilation is crucial, because winter spinach growing in a low tunnel or cold frame can quickly overheat on sunny winter days. However, even with good weather, spinach and other cold-hardy greens will produce little new growth during the short days of December and January. Then, when days lengthen in February and March, the plants will produce excellent harvests of crisp leaves. Winter spinach commences vigorous new growth at a time when soil temperatures are so low that the availability of nitrogen is limited. To meet the plants’ nutritional needs it is important to provide a booster feeding with a water-soluble plant food as soon as new growth appears in late winter. In addition to preserving plant vigor, well fed spinach plants produce larger leaves. By mid spring, the combination of longer days, higher temperatures, and exhaustion cause winter spinach plants to grow tall and bolt, which earns them a place in my compost heap. By then I have spring-sown replacements in progress that will keep me supplied with spinach until chard season starts in early summer. I do not think it is possible to grow too much spinach. "This is the best information I've ever come upon regarding over-wintering spinach! I have what might be a silly question but honestly, the only thing holding me back from trying my hand at growing over the winter... Do you water during winter, and if so, how? Thank you for sharing your valuable knowledge!" "Because my winter spinach stays inside a frame or under a tunnel, protected from rain, it does need watering occasionally. But evaporation rates are low in winter and the plants grow very little, so their need for watering is modest." "HYE.. IM JANNAH.. FROM BIRMINGHAM..I WOULD LIKE TO KNOW.. WHAT TYPE OF VARIETY THAT YOU HAD PLANTING BEFORE?? AND IS THAT OKAY IF I START TO GERMINATE THE SPINACH SEED AT LATE AUTUMN??" "Hi, This information is great! I'd like to try growing winter spinach for the first time, but I'm renting and I don't think they will appreciate me digging up the lawn. 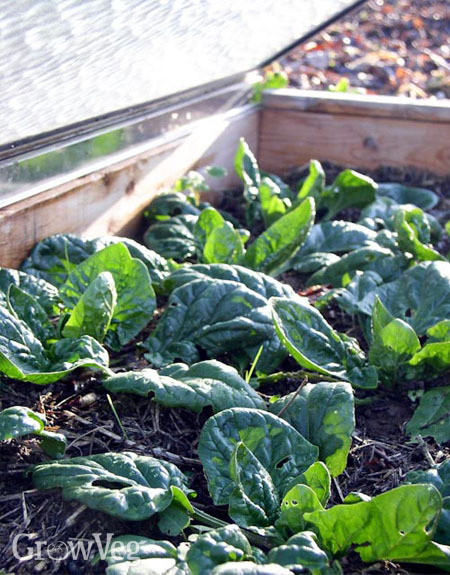 Can I winterize spinach in pots or a raised bed with the glass-topped cold frame? Thanks!" "A glass-topped cold frame should work fine as long as the plants' roots are nicely tucked in with soil. If you use pots, I would nestle them into a bag of compost laid on the ground and cut open. Unprotected pots may freeze and thaw so many times that the roots get seriously damaged. " "I live in Sandpoint, Idaho in Zone 5-6. The weather has been so unusual. We had winters without zero temperature, then last winter was very cold. I mostly want to plant spinach seed in the fall so the plants will germinate by themselves in May. I am off the grid so I can't have grolights. I raise everything from seed. My bok choy did not get heavy white stems because I planted too late. I never even got my beet seeds into the ground at all. I want to remedy all this. Please help me." "I am interested in cold crops which grow well here. I am hoping my purple Brussels Sprouts I have grown in huge pots can go into our cool attached greenhouse to finish. We have a woodstove for heat. My Swiss Chard, Zucchini did well. I'm just now planting asparagus roots given to me by a friend. Need tips! Do you know anything about foiling pocket gophers? We have a double electric fence around the garden for deer and they still get in. I am Biodynamic and belong to a gardening group that makes their own BD preps. My compost bed is made with cow manure. My indeterminate tomatoes (cherry brandywine and black krim) have been wonderful in greenhouse coldframes. Deer got my eggplant, peppers (in coldframe--have a few left), comfrey, sweet onions, broccoli, potatoes, sunflowers. This summer was in the 90s here with NO RAIN. We have 1/2 gallon/minute from our well." "If you have a small garden like mine ...about 1000 square feet a 6 foot fence stopped the deer. Otherwise an 8 foot is reccomended. I live in a deer laden area and it is the only thing that worked. I seem to have one gopher that will not go away, dont know how to stop the gophers. " "Hi, I planted my spinach last year and had a great crop. I thinned it out and stopped any seeding in the Autumn. My spinach has continued to grow over the winter but I was wondering if I should scrap last years plants and buy new or is there something I can do to keep what I have. Thanks"
"Exposure to cold, short days primes spinach plants for early bolting as the days lengthen in spring. I suggest keeping the plants until they produce a flush of new leaves in spring, while making plans to start fresh young seedlings in another part of your garden. Good luck!" The Itch to Plant: How Early Is Too Early?